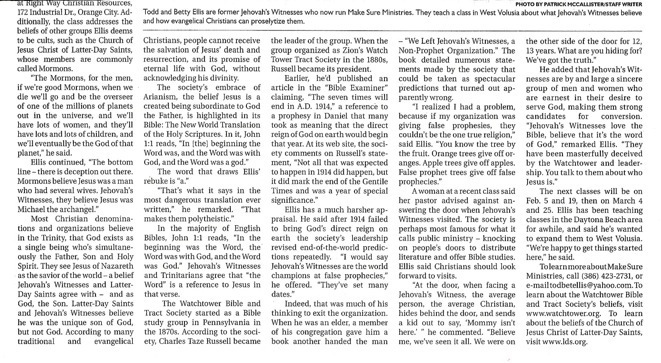 I was involved with Jehovah’s Witnesses for thirteen years and to this date I am still amazed by their ability to control individuals. This is the power of a cult–any cult–and I realize that my testimony many not bring anyone to Jesus but I pray that it would, at the very least, encourage someone to “make sure” of their beliefs. I was born in Providence, Rhode Island, to an Irish Catholic family. My mother was a Roman Catholic; unfortunately my father was a confirmed atheist. I attended all the catechism classes and I made my first communion. When I was about eight years old, my family moved to Pennsylvania and from that time on we never really did establish ourselves in another church. But my interest in God didn’t stop. I would go to church with all my friends (any denomination–it didn’t matter) and I would always listen intently to everything that was being said. At our home we had a small horse stable and I would often climb up in the loft and read an old Bible I had found, but I would get frustrated because I couldn’t understand it. 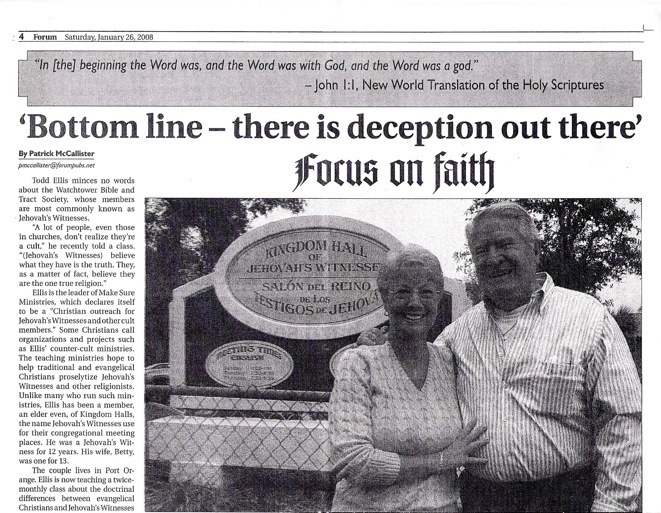 This searching went on for years with my father always adding doubts with his comments about the fallacies in the Bible. Maybe because we were so much alike–I’m not really sure–but I as grew older, my mother and I did not get along very well. As a result I became very close to my father. We would have long discussions about life and we’d plan my future and what he wanted for me. I thought he would always be there to share it with me. However, when I was seventeen, a senior in high school, my father was killed in a plane crash and it seemed like my whole world had come crashing in on me. I became obsessed with the subject of death. I wanted to know why people had to die. What purpose did it serve? Why would God want to hurt people by taking away their loved ones? I found no answers to these haunting questions and became very bitter towards life and religion. After two years of college, I married my husband, Todd. He had been raised a Lutheran and we agreed to raise our children as Lutherans. We had two beautiful little boys just twenty months apart. I was delighted with being a mother but again, being obsessed with death, I was terrified about their future. Were they going to grow up to be strong young men only to die in a war in some foreign land? I just couldn’t bear the thought. I was going to see my father again someday and he would have a second chance to accept Jehovah. They were totally against war and my boys wouldn’t have to die in one. They studied the Bible thoroughly which satisfied my long desire to learn it. And they assured me that my children would never go to school because Armageddon was just around the cormer. I couldn’t get enough: I attended all the meetings, went out in service, and on January 2, 1970, I was baptized. Just before I was baptized, my husband became interested and he was baptized in August of the same year. I might add that while I was studying, I kept asking my friends and family what they thought of Jehovah’s Witnesses. This would have been a great opportunity for them to help us, but instead, they just ran the Witnesses down and that just drove us closer to the organization. Oh how I wish that they would have come along side of us and just shared scripture with us. My mother completely disowned me and we were considered the black sheep of the family. We got very busy devoting our time to the Watchtower; I would auxiliary pioneer twice a year and Todd became a ministerial servant. We were so happy! We felt we needed a new start and in 1974 moved to the Schuykill Haven area and began attending a new congregation. We settled in and again got busy witnessing. Todd soon became a ministerial servant again and later an elder. By this time we had added a little girl to our family. It wasn’t until 1979 that I began to question doctrine. The November 15th issue of the Watchtower brought out a new interpretation on I Timothy 2:5, “For there is one God, and one mediator also between God and man, the man Christ Jesus.” (NWT) The Watchtower said this did not apply to all men, just to the 144,000 anointed ones. I was shocked. For nine years [that I had been a Witness] it had applied to everyone. Now it applied only to the 144,000. After reading the entire chapter in Timothy, I could not accept the change. (I know now that the Holy Spirit was teaching me.) I began to read all the publications carefully. I never would have considered leaving the organization at this point. The more I studied the Bible on my own, the more problems I began to have with their doctrine. For example, the “First and the Last” in Revelation; who was it? Jehovah or Jesus? Both Todd and I were meeting people at the door–nice people–were they going to die at Armageddon? About this time, due to financial difficulties, Todd asked to be removed as an elder so he could devote more time to getting us out of debt. I decided to pioneer in May of 1981 in order to strengthen my secretly wavering faith. At one door, I met a pastor named Randy Ott and we had quite a go-around. But this man was different. I could see that he was sincere and that he loved God. He was very respectful and kind to me. The Witnesses don’t know how to handle this. We both loved God and yet we both couldn’t be right. It frightened me and in desperation I cried out to God (when I was alone), “Why can’t it be clearer, God? I don’t want to die and I don’t want this man to die either.” (God hears our prayers.) I did not know it at the time, but this pastor had his whole church praying for me. When we got back the elders approached Todd and told him that unless he shaved off his beard, he would have certain privileges removed such as praying in the congregation or being in the theocratic school. The organization ruled his beard to be immodest and that it brought undue attention to him. Todd left the Kingdom Hall that day and never went back. For me it was different; I had the children to think about. I knew what leaving meant and the price we would have to pay. So, like a good little servant, I continued to attend the meetings. Many talks were given and everyone knew they were directed at the Ellises. I felt harassed, but continued to go out in service. I refused to use their literature–I would only use the Bible. That lasted about two months until I just couldn’t deal with it anymore. After many tears and much anxiety, we contacted Joan and Bill Cetnar. We had found their names in a tract that someone had given us. We had so many questions and they were patient and kind in answering them. I John 5:1 set me free! The scripture that set me free and means so much to me is I John 5:1, “Everyone who believes that Jesus is the Christ is born of God.” That meant me, not just the 144,000. Praise the Lord!!! He is my Lord and my Savior and no organization can ever take that away from me. Amen! In August 1982, our entire family, all five of us, were baptized in the name of the Father, the Son and the Holy Spirit. We have had to leave many loved ones behind in that organization who are still working hard to be saved. Our prayer is that God will keep opening hearts, that His wonderful light will shine and the veil will be removed from their eyes. Oh, that they might see the truth of His Word and share in the joy that we have experienced!